Aside from the core reply and assignment functions, there are various other actions you can apply to tickets. All the actions below are available from the buttons above the reply area. the live draft messages you see if another agent is replying to a ticket. Sometimes you may want to make clear to other agents that you’re working on a ticket and prevent them from editing it - for example, if you are researching the issue. Locking the ticket achieves that. The Lock button is above the reply area when you view a ticket in the content pane. You can unlock the ticket from the Lock button or at the top of this tab. The lock will automatically be removed if you stop using the agent interface, or after a period of time set by your admins (one hour is the default). This is to stop tickets being left locked for too long. DeskPRO can also be set to automatically lock a ticket while an agent is viewing it. Sometimes you will end up with two tickets about the same issue - for example, two different users in the same organization report the same thing, or a user emails about the same issue from two different email addresses. You can quickly merge two tickets together, combining their details to make one ticket. When tickets merge, some properties will be overwritten. For example, a ticket can only have one subject, so the merged ticket can keep the subject from only one of the original tickets. You can pick which ticket will overwrite the other ticket’s properties. If a value for a property is only set in one ticket, then it is kept in the merged ticket, regardless of which ticket you pick. For example, if one ticket is assigned to an agent in team A, and the other ticket isn’t assigned to any team, the new ticket will always be assigned to the agent in team A. If the tickets have different users, the other user will be added as a CC to the new ticket. The labels from both tickets will be applied to the new ticket. The Merge button is above the reply area when you view a ticket in the content pane. Open one of the tickets in the content pane. You are shown a list of the user’s tickets and open tickets. If you want to merge with a different ticket, click Search, then enter a ticket ID. It may take a second or two to show the matching ticket. Select the ticket you wish to merge with. The Merge Ticket window opens. Click Switch to pick which ticket’s properties to keep where there’s a conflict. The values shown in red will be overwritten. Click Merge these two tickets to complete the process. You cannot undo a ticket merge. Putting a ticket pending is useful if the user is awaiting a reply, but you are waiting for a third party to do something before you can respond. For example, you need to hear back from one of your company’s suppliers before you can send the user a solution to their problem. If there are tickets pending, you will see how many there are in the Awaiting Agent area of the filter pane; the checkbox toggles between not showing pending tickets and only showing pending tickets. A good way to make sure you don’t forget about a ticket you mark as pending is to create a Task (see Tasks) linked to that ticket. You could also create a custom filter for pending tickets. You can change the user associated with the ticket from the Actions pull-down menu, creating a new user record if necessary. For example, if user A creates a ticket, but then tells you that user B will be handling it from now on, change the user. That way user B will receive emails about the ticket, will be able to track it from your web portal, etc. If there are messages about two different issues mixed up in a single ticket, you can use Split Messages To New Ticket from the Actions pull-down menu. 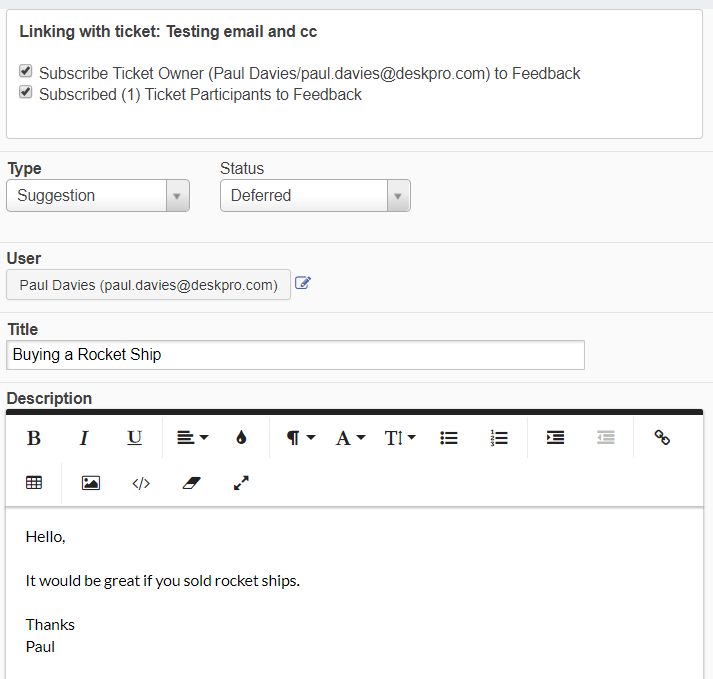 Enter a title for the new ticket, and select the messages you want to move with the checkboxes. The user for the new ticket will be the same. You can also split off an individual message from the ticket history into a new ticket. Click the gear icon at the top right of the message, and select Split Message. Sometimes you might want to have separate tickets for the same issue. For example, suppose a user raises a ticket and you need to discuss it with an outside contractor. You don’t want to change the ticket user, and you don’t want to add the contractor as an agent. The solution is to create a linked ticket, using Create Linked Ticket the Actions pull-down menu. The new linked ticket acts like an independent ticket, but you can see that it’s linked to the original ticket when you open it in the content pane. This is a useful feature for scenarios where a customer submits a ticket that you want to turn into a feature request. Create Linked Feedback opens the New Feedback tab. The New Feedback shows a message at the top saying it's being created as a linked item to the ticket. This also works the other way around: you can see a "Linked Tickets" tab in the Feedback Properties box, listing the linked tickets and the same "X" icon to remove the links. Link Existing Feedback displays a search box where you can enter feedback title or an ID to find the feedback item you want to link the ticket to. If you realize that the issue in a particular ticket should be addressed in a knowledgebase article, you can use Create a new pending article from the Actions pull-down menu. Enter a note describing the article that needs to be written, then click Add. This creates a pending article in the Publish app. The pending article is linked to the ticket, making it easy to refer to the ticket while writing the article. You can select Print from the Actions pull-down menu to display the ticket in a layout suitable for printing from your web browser. You can select Download PDF from the Actions pull-down menu to get a PDF version of the ticket details and message history.